After GM’s India exit, Ford-Mahindra ‘strategic alliance’ under spotlight. Ford India is the second American auto major coming under the spotlight for an India plan that’s yet to take off. Earlier, General Motors (GM) left India in 2017 after pulling the plug on its Chevrolet brand. GM had struggled for almost a decade with negligible market share and an inability to launch best-sellers. Declining to comment on speculative reports of a potential joint venture agreement with Mahindra & Mahindra, officials with Ford India highlighted its growing sales and revenue numbers as proof of stability. Last year, its domestic revenue crossed a billion dollars for the first time with profit (PAT) at Rs 526 crore. Still, sales and financial figures are tiny when compared to market leaders such as Maruti Suzuki and Hyundai. Ford India hasn’t shared GM’s fate but market share hovered under 3 per cent, which is low given it has been in the country as long as Hyundai. The Korean carmaker's share accounts for around 17 per cent. “We cannot comment on speculation. Ford is committed to India and we will continue to bring products that Indian customers want and value,” a company spokesperson said. But will the possible tie-up with an Indian firm be the first step towards exiting the country for Ford India as a solo player, or is it a sign of things to come for automotive players, given disruptions such as electric technologies and mobility platforms like Uber? Mahindra tried to tie up with Renault but failed and an earlier alliance with Ford barely ran for three years. Others haven't had much luck either. Suzuki planned an alliance with Volkswagen which failed before it even took off. The underlying problem in most of these cases is blending DNA and culture, which are inherently so different for large corporations that come from different countries that it rarely works. “It’s quite likely that Ford may be wanting to deleverage its balance sheet to free up capital that is being used for sales and marketing and instead focus on product, through a future tie-up,” Majithia said. That Ford has invested in India is no exaggeration, with the company making small cars and low displacement engines for both the domestic market and exports. It also pumped in around $2 billion to set up its factories and launch cars here. 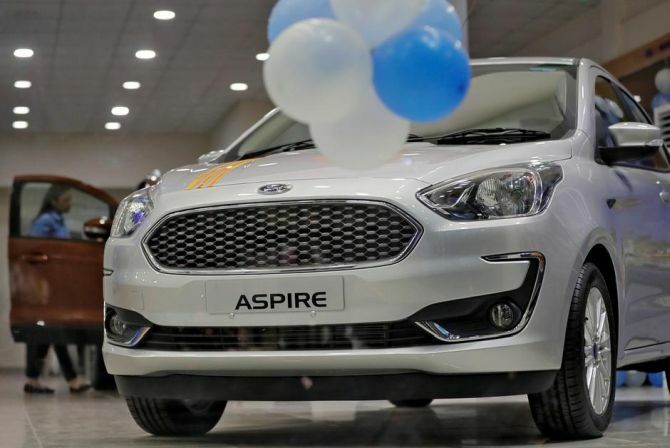 Ford exports the Figo, Aspire, and EcoSport to over 50 markets around the world, and has an installed manufacturing capacity to 610,000 engines and 440,000 vehicles, with more than 465 sales and service outlets in 267 cities across India. But its Figo hatchback, once a hit car, now has competition and hasn't quite evolved to keep up with market trends that have been capitalised by those such as Maruti Suzuki’s Baleno. Rakesh Batra, partner and auto sector leader with EY, said it's also about Ford’s entire global restructuring worldwide. “Most large auto companies are looking closely at their international investments and rationalising them. In 2017, Mahindra and Ford had announced they would join hands as part of “a strategic alliance”, that would work on a small electric vehicle and a compact SUV that would be worked on by both but branded and sold separately. Officials of Mahindra declined to comment. Pawan Goenka, Mahindra’s auto business managing director, once a former engineer with GM in America, knows it has to jump-start sales. In a financial year that saw the utility vehicle category grow 21 per cent in volume, Mahindra (with the largest fleet of diesel SUVs in its portfolio) saw sales stay flat and hover under 250,000 units a year for the last three years despite the segment growing to a million cars. Mahindra’s market share dropped drastically going from over 50 per cent in 2011 to under 40 per cent in 2015. It reached a new low of 25 per cent last year. The missing products haven't been just city SUVs but also competent petrol vehicles. This is also something that analysts question.